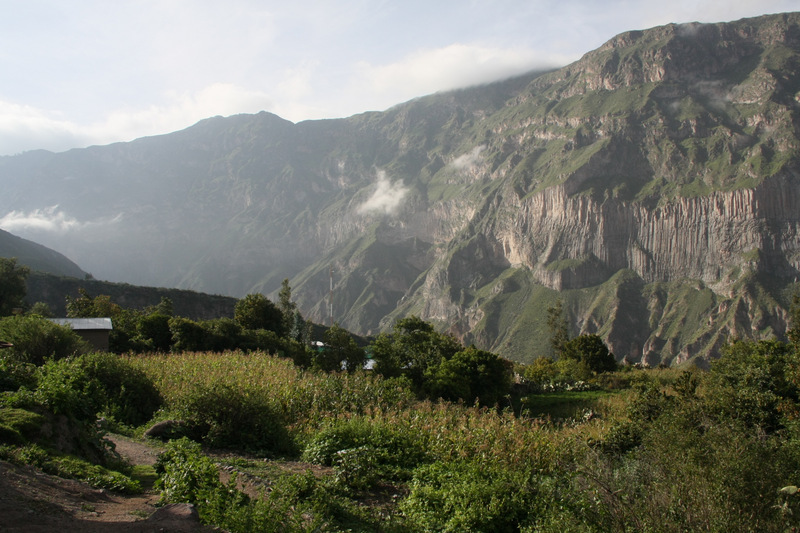 We woke with the roosters this morning and were met with the spectacular sight of the Colca Canyon ravine at the edge of our hilltop village. After lending a hand in the kitchen for breakfast, I was dressed up in Rufina’s (host mother’s) embroidered traditional clothing….dressing me up in local garb seems to be popular around Central and South America! I was then paraded around the village and taken to the dam for a ‘photo shoot’, much to the amusement of village onlookers and followed at the heels by our host family’s dog-cupboard love…I am sure he could smell his owner all over me. After saying our goodbyes we set off with our two guides. With a big day ahead of us, we still had to hike down to the ravine, cross over and scale the entire mountainside (did I say ‘entire’?) to get to the town at the top. Stopping along the way in the wee village of Malata, we were given another delicious plate of tuna…scrummy! One of my most favourite customs in these parts is the signalling of village entry and exit with a cross. 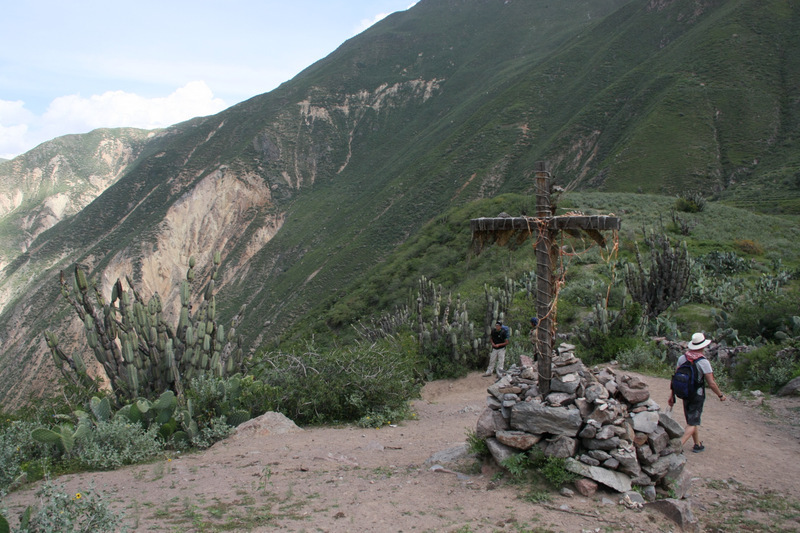 Leaving Malata for our descent into the base of the canyon we came across a rickety and time worn crucifix on the hill. 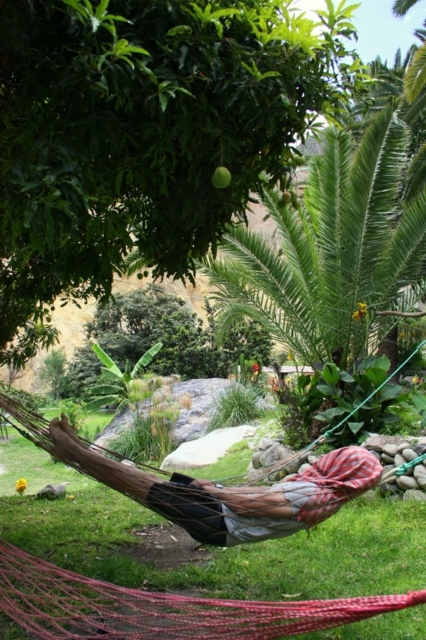 After arriving at Sangalle– the oasis on the other side of the canyon- we had lunch and napped under the trees for a few hours. This is the spot where some tours take the evening to sleep over and others just catch a nap and ascend the canyon from base to plateau by nightfall…ours was the latter! It’s a steep vertical climb of roughly 4 hours, starting at an altitude of 1900m and reaching 3287m. We took it fairly slowly, ignoring the offers of mule rides as they passed us. The last hour however was grueling: legs wobbling, the skies darkened and sheets of rain started pouring down on us. We arrived in Cabanaconde Village by torch light using a short cut through the rain soaked corn fields. It was an incredibly tough day, but our sweet reward was worth it-dinner and a hot shower. It’s the simple things that matter most.